Many people worry about the manner of their death. Death by car accident, death by cancer and death by gunshot are some of the more dreaded ways to go. No less awful is the prospect of death by snakebite. So a new research finding proving how snakes transfer poison to victims will provide little comfort. Surprisingly, only now have scientists carefully measured the flow of snake venom. They say that many snakes kill not by injecting poison under pressure via a syringe-like tube, but rather by the force of surface tension along an open groove. 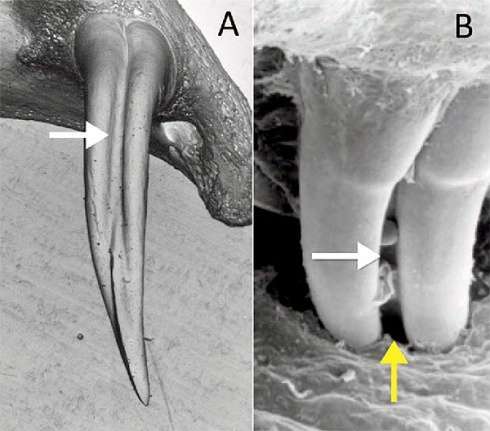 "Nobody ever bothered about the question of why most snakes have fangs with open grooves rather than a tubular shape," said Leo van Hemmen, who works at the physics department of the Technical University of Munich in Germany. He and his colleagues teamed up with researchers in the department of physical therapy at the University of Massachusetts Lowell to study exactly how venom gets from the snake to the victim. The surface tension of a fluid arises from the interaction of molecules in the fluid. This tension is what allows a lightweight mosquito to stand on water. To illustrate how surface tension actually propels liquids, van Hemmen points to something called "tears of wine." In this common phenomenon, thin drops of wine -- resembling tears -- form on the side of a wineglass above the level of the wine. The reason for this is that the surface tension for alcohol is lower than for water. Near the surface some of the liquid, which has lost some of its alcohol to evaporation, is boosted upwards by liquid below with its greater alcohol content. This film of wine, hoisted upwards by the difference in surface tension, collects and forms into tear-shaped droplets. Something like this happens when a snake bites its prey. 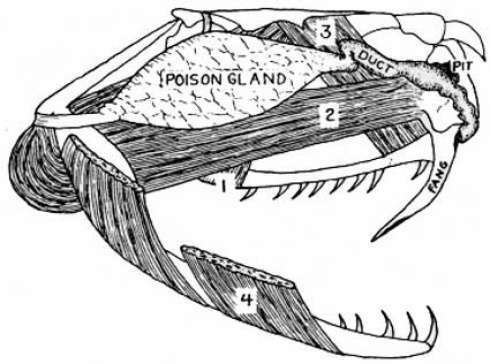 The deadly fluid from the venom gland moves along the open groove in the snake's fang because of the differences in surface tension between the venom inside and outside of the groove. Van Hemmen and his colleagues are the first to measure this process. If the venom seeps rather than squirts under pressure, wouldn't this make "envenomation" a slow process? It would, but then most snakes aren't in any hurry. One collaborator in the new study, Bruce A. Young of UMass Lowell, said that snake venom incapacitates the prey and also helps with digestion. "From the snake's point of view, there is no need to kill the prey, as long as it cannot escape or injure the snake," said Young. "Most venomous snakes hold their prey in their mouth while the venom works." Young, who directs the anatomical laboratory in the department of physical therapy at UMASS Lowell, said that some herpetologists were so fascinated by the whole venom-delivery process that after themselves being bitten they would neglect to get aid in time, with fatal results. And in case you were wondering how venom works, Young summarizes the effects, which depend on the specific snake: "Some venoms disrupt nerve transmission, some impair muscle contraction, some disrupt blood cells, and others do a more generalized disruption to the cells." The new venomous results appear in the journal Physical Review Letters.